That Yugoslav flag on the customs house at Jelsa on the Dalmatian island of Hvar dates the photo above. It was taken when I was 18 during my never-ending rites of passage travel. 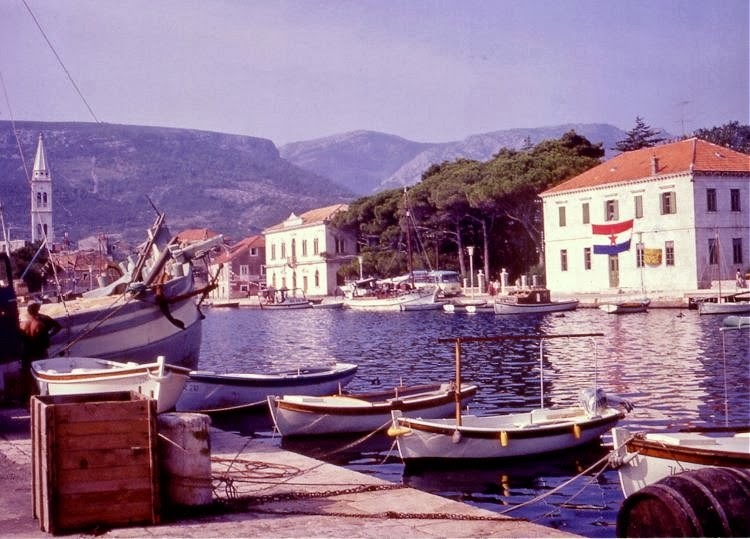 In 1968 Tito's benignly Communist Yugoslavia was a lotus land two decades away from the the humanitarian carnage that was to engulf and destroy it. 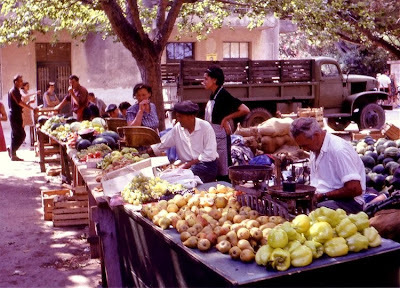 Back then the currency was soft, wine and food was ridiculously cheap, and life was extremely good. Rock music had opened my generation's ears and eyes to cultures beyond Western Europe and North America, but Yugoslavia, with its volatile mix of Rome, Byzantium and Islam, was my first taste of the real thing. But back then it was not the nuances of culture that hit me, instead it was the sensory impact of the Balkans: the sounds, sights, tastes, smells and other sensations that exploded from the market seen below, and from everywhere else I visited on this unique cultural watershed. Western thought recognises the five senses of hearing, seeing, touching, smelling and tasting, to which Buddhism adds the sixth sense of mind with its associated processes of cognition and reasoning. Jordi Savall's new project is titled Bal-Kan; the word Balkan is a compound of the Turkish for honey and blood, and those two words provide the sub-title of the lavish triple CD and book project seen below. In his introduction to this celebration of Balkan music and culture Jordi Savall quotes Voltaire's observation that 'Without the senses there is no memory, and without memory there is no mind'. Similarly, without the senses there is no music, and the art of performance depends, in varying degrees, on the engagement of all six senses. Yet in our reductionist digital age, music has been reduced to a mono-sensory hearing experience, with a de facto standard of hermetically sealed binary music files delivered via headphones. Jordi Savall's book and CD projects are the ultimate anti-reductionist statement; none more so than Bal-Kan, which seduces the hearing (SACD music content), seeing (book content), touching (tactile content) and cognitive senses (meta content) so powerfully that, when auditioning it, I swear I could smell and taste that market on Hvar. 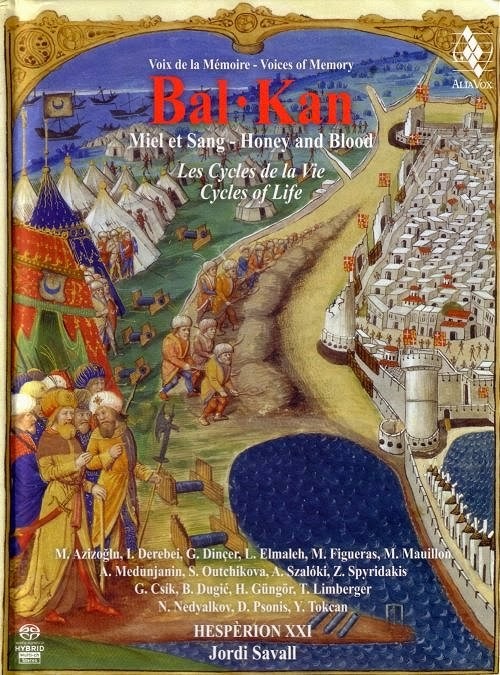 Without all six senses there is no music, and Jordi Savall's Bal-Kan project provides a vivid reminder of just how deracinated today's mono-sensory music has become. * My 2008 radio interview with the perenially anti-reductionist Jordi Savall can be heard on SoundCloud. Photos are (c) On An Overgrown Path 2014. No freebies involved in this post. Any other copyrighted material is included as "fair use", for the purpose of study, review or critical analysis only, and will be removed at the request of copyright owner(s). Also on Facebook and Twitter. There is no doubt that in the last few posts there has been a fascinating discussion but in this post the argument goes too far- a reductio absurdum in fact. How many senses do you think can be involved in listening to digital music with headphones? Nobody would argue that the sounds and experience of a live orchestra is diminished in any recording, not just in digital ones. But does this mean that no valuable sensation of the music can be obtained? Last week I recorded a live stream of an opera from a European radio station. It was streamed at only 128kbps and the wave graph of the recording is compressed and flat. Yet I am getting considerable real musical experience from listening to this recording. What justifies such listening in this case is that the opera is rarely performed ( one performance in the UK in 60 years of the works existence I think ). There is a vast range of works composed in the 20th century we never or rarely hear in the concert hall that can survive and be listened to in this way. I remember the days of listening to medium wave transmissions of European concerts when the sound was fading in and out and offered nothing like the quality of what I can hear in concert streams over the internet on my computer or other audio devices..
Why be so sniffy about such audio experiences? Of course it is important to go to live concerts, to support the artists as well as hear the live sound. But not all of us live close to London and 2 or 3 trips a year to the capital are the best I can hope for. I recognise that when I listen to music on my MP3 player the experience of the sound is compromised, but for spells in hospital or even train journeys such devices are for me irreplaceable. It is a different experience to listening to music live but is still surely music. I know you do not mean it that way, but I think the title of your article is rather insensitive to musicians such as pianist Nobuyuki Tsujii -- who cannot see -- and percussionist Evelyn Glennie -- who cannot hear. Nobuyuki Tsujii international fans site owner - sorry, but I find your comment disingenuous. As you yourself note, my post in no way at all refers to sensory impaired musicians, and it is absolutely crystal clear that it refers to the quote "de facto standard of hermetically sealed binary music files delivered via headphones". In addition I was very careful to qualify my statement by saying (highlighting added) " the art of performance depends, in varying degrees, on the engagement of all six senses". Moreover regular readers will know that OAOP is one of the few blogs to explore the processes that allow sensory impaired musicians to perform at the peak of their art. John Babb - I think it is also quite clear that my post refers to the quote "de facto standard of [listening to music via] hermetically sealed binary files delivered via headphones". Of course mobile audio players and compressed files have their uses and regular readers will know that in a recent article - http://www.overgrownpath.com/2013/12/exploring-ragged-edge-of-silence.html - I praised my own experience of iPod listening while hiking. (And incidentally I too live several hours from London). But the concern is, as I clearly say in the post, that low resolution mono-sensory listening is becoming the de facto standard for classical music. As you say yourself, that kind of listening is "compromised", and the increasingly widespread acceptance of that compromise is why I wrote this post. Fringe subjects such as the interconnectedness of classical music will always be contentious. But it does seem to be increasingly difficult to swim against the popular tide without being accused of being "sniffy" and "insensitive" and of peddling "twaddle". Perhaps it is now time for OAOP to abandon these fringe paths and, instead, become yet another PR outlet for Universal Music, BBC, Apple, Sinfini Music, iTunes, Amazon etc etc while at the same time promoting my own (non-existent) ambitions as a music journalist. thanks pli for pointing us to what looks like another great album. The excellent Voltaire quote reminded me of something D. Hockney once said: "I see everything through the prism of my memory" (more or less). don't know if you've read this, but I found it fascinating. Billoo, thanks for that. In his powerful introduction to Bal-Kan Jordi Savall extrapolates the Voltaire quote to say "without memory and mind there is no Justice of Civilization", a thought that I am sure will appeal to you. Your reference to Hockney is interesting in the context of the two 1968 Kodachrome slides that illustrate the post. Even after the multiple manipulations of digital scanning, resizing and web browsers the difference between the analogue originals and today's de facto binary standard is very obvious. This thread is very rich in linkages for those who can see beyond the narrow confines of political correctness. Yes, I think you're right, pli. Unfortunately, whenever one talks about quality nowadays-in whatever context-one is immediately faced with an almost instinctive reaction: the charge of elitism or snootiness! Which is quite odd, really, since from what I can gather you've insistently and repeatedly been making the case for *greater* accessibility to quality music and listening experiences(equality and quality, together). Personally I prefer vinyl, the seventies-type photos and the old films with their emphasis on storytelling but that may just be my age showing!